Rated 5 out of 5 by bitwhat from If you love Royal Envoy! This feels like a very high quality Royal Envoy copy -- in the best way possible! Similar gameplay and similar challenges, in that it's not just about accumulating resources as quickly as possible but in choosing the right strategy of which kind of buildings in which order to achieve the goals. Rated 5 out of 5 by jen505 from The more I play, the more I like it Time management is my favorite genre and I like games that are challenging and require multiple plays to get 3 stars. This is definitely that game. It's nice to have the guide within the game instead of finding walkthroughs online. The instructions help you get 3 stars, though I sometimes find other ways work best for me. There are also many levels, making this game a really good value. Hope there's a sequel! Rated 5 out of 5 by Eeryan from Best one in a long time 100 levels of increasing difficulty in a good pace. Many have to be replayed to achieve 2, let alone 3 stars. It's been a long time since I've done little else but try to beat level after level this way. Good, easy gameplay, lovely graphics. Good old fashioned, non 3-D TM game. Awesome. Thank you! Rated 4 out of 5 by Ongoldenpond from This is a gem if you like strategy time management games When I began this game it seemed too easy. As it progressed it just got better and better and you really had to think about what to do. I almost missed this gem of a game and was glad I continued. Although it got harder as you went on, it was not so difficult that you couldn't figure things out. Well worth a try and a buy! 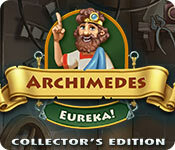 Rated 4 out of 5 by CAbood from Archimedes: Eureka! Love the game and the difficulty, would like to use the strategy guide everyone is talking about, but I can't find it in my collectors edition. Very disappointing and I have several levels I can't get all my stars on. Rated 4 out of 5 by Rmuh from Too challenging with a poor strategy guide This game has lots of levels and appears good value for money however I am unable to finish most levels within the gold time. I referred to the strategy guide and find it confusing even if I have tried the level several times so I am familiar with the layout of the level. In addition I tried to look for tips in the forum and I find there isn't a forum for this game so no help available there. I mostly like the game apart from having to collect all goods and income or it disappears which is very annoying on the more complex levels. I always buy this sort of TM game and am usually able to get gold with some effort but this is just way too hard. Rated 4 out of 5 by Sestra from You take what you can get... Because TM games are so few and far between, I tend to buy any that turn up. That said, I did in fact download the trial with this one...and was grinding my teeth with frustration before the end of four levels. Having now played many more after buying the game, I can honestly say they only get harder! I concur with other reviewers who say this game doesn't grab you: it doesn't, but it's enough of a challenge to keep me engaged none the less. There isn't much of a plot/story-line, but never mind, it's a TM game, and in a desert where TM games are like oasis, it's a welcome sight! It is rather as if several TM game devs got together in a room, got waaay too friendly, and gave birth to this game, because there are recognisable elements from a number of different games. I have found a couple of glitchy levels where the mouse "floats", which is a pain because you have to be fast to get those three stars. On the whole: It'll do. Rated 4 out of 5 by SilverCat463 from Very good TM game This is very like the Hercules series. I like it very much. Some of the criticisms in other reviews are valid. Like the waiting for the money to build. I found that true but only on the first couple of levels. Otherwise you are kept quite busy. Also, the click a second time on things is a bit distracting, because you think you have sent the guy off to do something only to find that it didn't 'take'. Have to do it again. This game suits me, I am enjoying it. There is enough challenge that I have to replay some of the levels to get gold. Yet not so hard that you never get gold on the first try, but then I am an experienced TM player. A definite buy for me. Don't know if it is worth it for the CE. Wallpapers are not my thing. Don't care about them. Sometimes I really like having a guide available. Rated 4 out of 5 by joybelle_1 from Poor man's Royal Envoy Based on only having played the trial. It is a "gather resources" "build, buy and upgrade" "hire workers" game. It is also quite challenging so I guess that's why it is classified "strategy" and not "time management" I had to repeat a few levels even at the start, but I was getting used to "the cost of things" It is quite fast paced to get gold. It does however feel like a bit of a fruit salad of many games gone before, particularly 'Royal Envoy' re the goals and gameplay,"chop wood, gather 350 food, build 5 upgraded houses, have 9 workers" etc . But compared to that game, it is a bit cold and a bit lacking in character. The graphics are quite cute in themselves, I guess in an attempt to give it some warmth. It seem to have all the bells and whistles, strategy guide, wallpapers and achievements, and hopefully it will have bonus levels too. I think it is a game worthy of being called CE, but it just didn't grab me enough to not wait for a sale. I can only give it 4 stars which is a shame when all it needed extra perhaps was more player connectedness to the characters. I do enjoy the level of challenge. I recommend this game. Its a good cross of strategy and TM. Rated 3 out of 5 by unicorn68 from Bought it but I regret... The levels get so challenging, that I cant achieve 3 stars and you cant choose the difficulty! Next time I will for sure look for that feature, as this is so frustrating! I play alot of TM Games but this one I wouldnt recommend at all. Rated 3 out of 5 by Keeper2614 from Typical strategy game but nothing special The game is okay but not a fan of the audio confirming accomplishments ("objective achieved"). Rated 3 out of 5 by joannes0 from Decent The gameplay works as it should. The storyline is kind of boring, not as cute or exciting as some of the others. My biggest complaint would be the lack of explanation on what everything is and how to do certain things (like that the shovel icon meant you could upgrade a house...or even what upgrading it meant for this particular game). All in all, a good time-waster, but not as fun as some of the collector type games. Rated 3 out of 5 by Scottar from Hard to Interface With It's a nice, challenging game with decent graphics and music. But the interfacing in the game process is quirky and hard to click on the play menus, you have to click on a certain spot. And the income doesn't seem to automatically add to the innovatory unless you pass your cursor over the production resources. I got to level 2.3 which seems impossible to get the 3 gold star time bonus even when following the guide. I never even got close and usually I'm petty good at getting the max time bonus awards. Aggravating, not fun. Rated 3 out of 5 by kndmanz from Music is awful This game looks a lot like the 12 Labors of Hercules series, but isn't nearly as much fun. I only played the first few levels and I hated the music and the repetitive tasks (chop down trees, build houses, collect gold). I loved the Hercules series so I had high hopes for this game, but it's pretty disappointing. It's a shame since there are so few TM offerings. Rated 2 out of 5 by jmttm from Nah Simply put........nah, not really worth it. Dull and slow. Rated 2 out of 5 by lstaple from Annoying For the first time ever with a BF game, I only played 15 minutes of the trial and had to stop. The music is so annoying, I ran away. Unfortunately, this is not a game you play without sound. Sigh. Please give us another strategy game, please, without this vile, awful, annoying music. Rated 2 out of 5 by ImBrookesMom from Impossible I love these games. When I play them I will play the levels over and over until I get the 3 stars to finish the level perfectly. In many games I do have to play it over an over because I am missing it by seconds, with this game I follow the strategy guide exactly as it is listed and the level is still completed way under the amount of expert time. If you play the games trying to get that expert time then dont play this game. I wont even bother finishing it, it was a waste of money. Rated 2 out of 5 by stanliness from Disappointing I love TM games and have purchased every Hercules game, even though they aren't my favorites, because they offer some enjoyable games. It seems they tried to do a new type of TM game, and it totally flopped. The music is awful - loud, distracting, and annoying - and it doesn't even have anything to do with the time period. The play is clunky - slow and somewhat awkward. The whole thing is very repetitive. I rarely stop a game before finishing the demo - this one was just so boring I lost total interest. 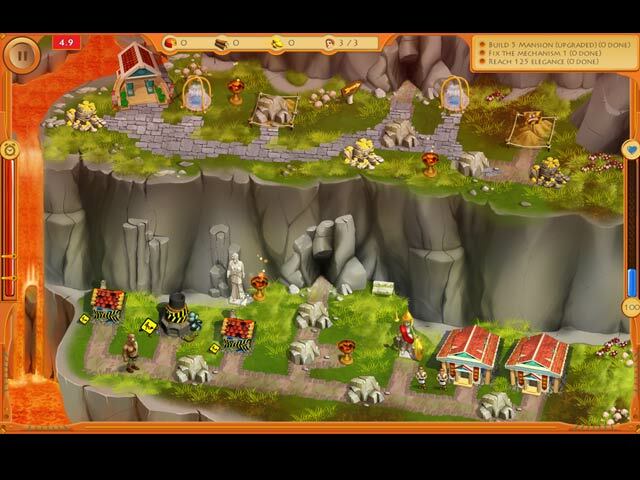 Rated 2 out of 5 by Spookys_Mom from Not A Fan This is a gather and build game but no where near as fun as the Hercules series (same developer). I am not a fan of games where you have to build a sawmill get all the wood you may need then destroy the sawmill and build a market to get food. There is no regenerating of any of the sources like other gather and build games. This really puts me off. Once you have everything else done sitting around waiting on the houses to generate gold so you can buy food at the newly created market is not my cup of tea. I will pass on this game. Bring us a new TM with Hercules and The Gang, that I will buy. Rated 2 out of 5 by dollfaye from Just didn't do it for me. You know how, sometimes, you play a game even when the reviews aren't that hot and you are surprised at how wrong they all were? This isn't one of them. After just the first 4 levels, I was reaching for the exit button. The graphics weren't that bad at all. I have neighbors on the other side of my wall here who are sleeping so I don't have the sound on. I just found the so-called challenges to be boring and uninspiring. Just a big click-fest with not much to keep your interest up. Add to that levels that are almost impossible to beat in gold time and I'm done. Sorry, but I won't buy this even when it's the deal of the day. Rated 1 out of 5 by Yaelle from An Aggravating Experience I’m shocked - I love TM games in general, and others by these developers. But nearly everything about Archimedes was annoying, boring & painstaking! 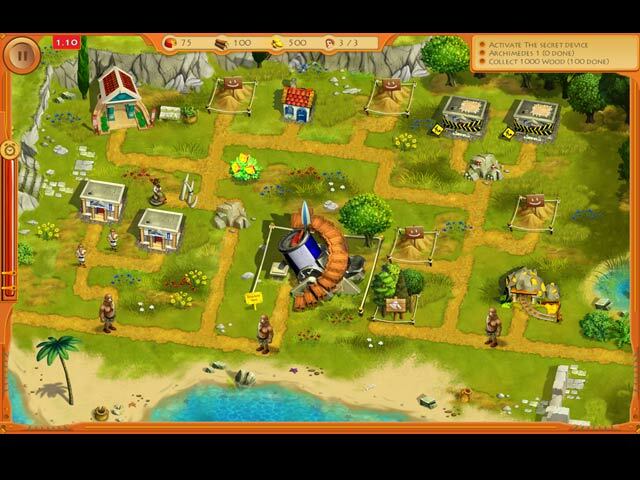 For example, you have to CONSTANTLY click on the generated income from buildings or it disappears. I mean, constantly every few seconds. Even following the in-game guide I found myself just barely squeezing in 1 star in most levels, and that was partly just because it is all an unrealistic jumble of tedium. I’ve played about every other game in this genre, so am no novice. Rated 1 out of 5 by Jaded from Waist of time Lame, its like stealing pieced from 12 Labors of Hercules and mixing it with a time management in the worst way. The female congratulatory voice sounds like she hates her job and the game play is just tedious. Never going to buy this game! Rated 1 out of 5 by pennmom36 from PAINSTAKENGLY BORING RESOURCE TM GAME Normally, I like TM games by this dev, but Archimedes is really a snooze-fest! The music was so loud when I first opened it up, that I couldn't get to the setting page quick enough. I turned the music way down, only to discover a horrible twangy banjo, slapstick tune between levels that was so irritating I finally had to turn the sound completely off, which is something I've never had to do in all my game-playing years! The TM levels were bland with the same yellow-ish hues, it was an immediate turn-off with nothing colorful to look at. Level after level seemed to present nothing exciting, in fact, each level was repetitive, build 5 houses, chop down all trees, remove all rocks, repair all bridges. Earn a specific amount of gold (I'll get to that gripe soon) It seemed like I was doing the same thing over and over. When you construct a building you must click on the plot, then choose Hut or Facility, then you have to click again on the pop-up or it won't be queued, which seemed like an unnecessary extra step. There aren't any food sources, either along the paths or via a farm etc. you have to build a Market and buy the food. The whole time you're playing the level, a woman is narrating, you need more "servants" not enough food, not enough gold, which just annoyed me after a while. 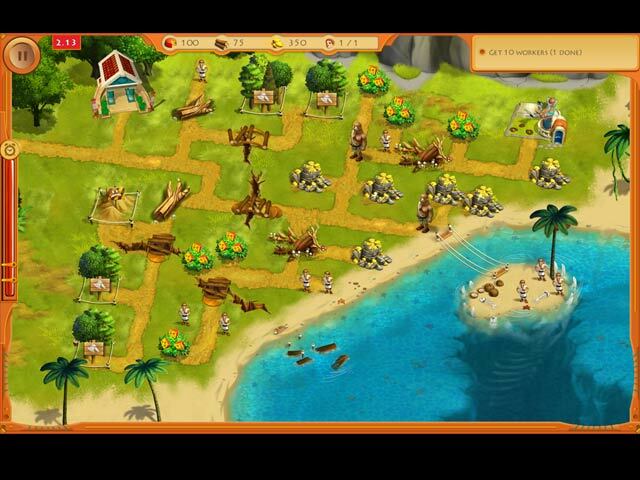 Several of the levels required me to build a specific number of Huts and Earn a specific amount of Gold. I was able to build the Huts one after the other, without wasting any time, then I had to sit there with nothing to do while I waited and waited for my huts to earn Gold, and because it took so long to earn the gold, I lost a Star! I replayed the level, built the huts quickly, then upgraded the huts to make more money faster, and I was STILL having to wait. Who wants to watch the huts make money with nothing to do? As far as a Collector's Edition Version goes, you get a built-in Strategy Guide, 9 Wallpapers, and 20 Trophy Achievements, but I hardly think that's worth twice the price?